6) 1-4 brush cut, 4-2 kickup, 2-3 backdoor. For ease of reference, all are shown going upcourt in the diagrams, not alternating up and back. - use a ballscreen series. See dribble-drive offences - Basics, Walberg, Calipari, Nets, Ballscreens, also Fast break - Florida five cycles, 6 cycles, Shooting - Dribble drive. 1 drives for a layup. - 1-3 or 1-2 backdoor, 5 tees up. 1-4 kickback, 4 racks it, 1 fills behind. - 1-4 kickback, 4-1 throwback, 5 ducks in (Calipari). 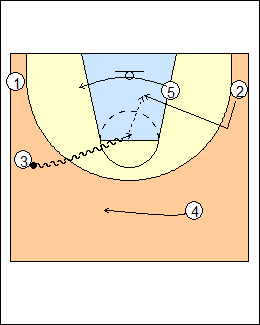 2 elevates for a pass, 1 basket cuts and clears weakside. Variation - 2 makes a return pass to 1 (give and go). Calipari - they want 2 to drive. Mads Olesen - 5 looks to screen every time someone cuts under him. If 5 is a dominant post player, it's a good option to have 1 set a screen for him. 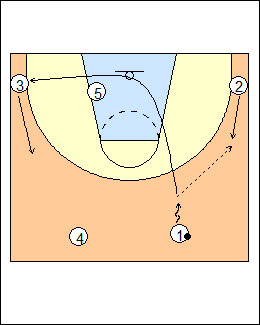 2 drives middle for a kickback to 3, who racks it (Calipari). - 2 drives baseline, hits 4 filling behind, exits. Marc Hart - 4 has the right side all cleared out to attack the rack. 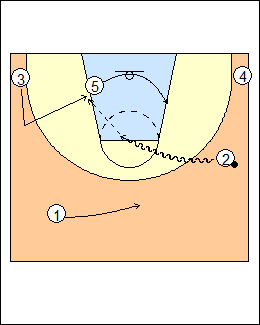 Calipari - 1 comes out of the corner when 2 gets to the middle of the lane. Olesen - 1 will stay in his corner then look for drop-zone options on any stop, the kickback to 3 is a great option. Jerry Petitgoue - they want a baseline drive by 2. 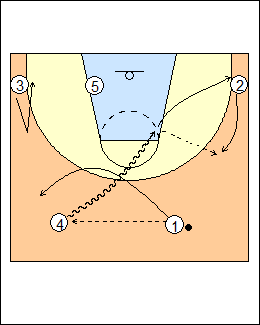 1 passes to 4 and corner cuts, 4 passes to 3 and corner cuts weakside, 5 posts. 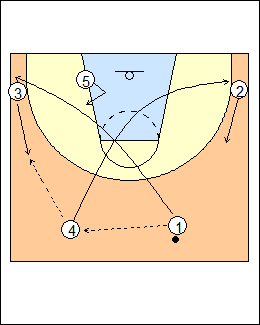 Option - 1 makes a basket cut (through cut) then exits using 5. Walberg - if you want to get 5 the ball, swing it from 1 to 4 to 3, 1 and 4 hold. 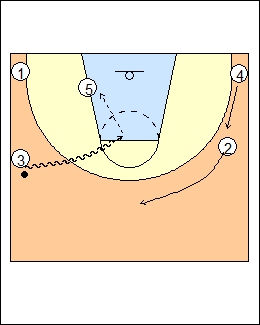 Calipari - to create a lane for 3, 1 passes to 4 and holds, 4 passes to 3 and basket cuts, 5 relocates, 3 drives baseline. Olesen - if 5 is dominant and 4 swings the ball, 1 must recognize this and exit weakside on a through cut, anticipating a post pass (4 holds). The first rule to get the ball to a great post player is the middle rule, when 1 passes to 4 (across the middle of the court) he does not cut, 3 comes up for a catch and post entry. 3 drives middle, passes to 5. 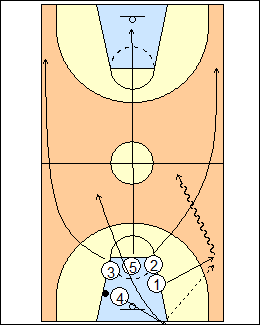 Variation - 3 makes a post-entry pass from the wing, or passes to 1 who passes inside. 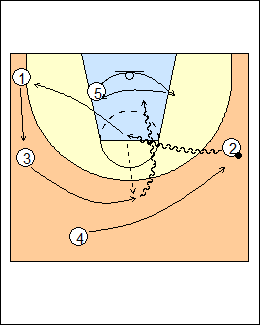 See Quick hitters - Duke actions (Corner). 1-3 kickup to start (drop 3 kickup). Option (shown) - 4 brush or loop cuts to create a gap for 1. Olesen - 3 can't move until 1 hits the drop zone. 3-2 backdoor cut (drop 2). - throwback to 1 in the corner, 5 posts. Start with a 1-4 brush cut (rub cut) or tee up and 4-2 kickup. Xavier - 2 can come out or backcut along the baseline, 5 occupies his man to keep him from helping on the backdoor. - 1-4 kickback, 4-2 quick (Calipari). - throwback to 4 in the corner, 5 posts, 2 cuts through. Walberg - kickback to kickup to drop 3 backdoor. 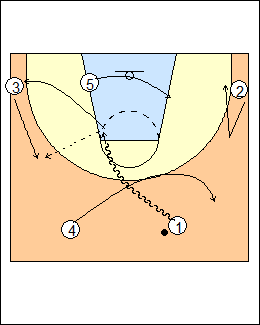 Shaka Smart - Ram set - 1-4 tee up, 4-2 kickup, 2-1 kickback, 1-3 skip pass, 5 ducks in for a pass. Greg Kampe - Loop-pitch-red - 1-2 kickup, 2-4 kickback, 4-3 skip pass, 5 seals in the post.